Protesters hold a sign at the YouthStrike4Climate student march down Regent Street onin London. Extreme weather fueled by climate change is wreaking havoc across the country, but Senate majority leader Mitch McConnell and his Republican caucus are making a mockery of the debate on climate action. Republicans and President Trump may choose to be in denial about the consequences of climate change, but to everyday Americans the climate crisis isn’t politics, it’s life and death. Yet instead of confronting this immediate threat to our country, McConnell held a sham vote earlier this month on the Green New Deal resolution that I introduced with Representative Alexandria Ocasio-Cortez of New York. Republicans called the vote without any hearings, without any expert testimony, without any discussion about the impacts and costs of climate change or the benefits of taking action. Their obvious goals: Protect the bottom lines of the oil, coal, and gas companies that fund their campaigns and shield their vulnerable Republican colleagues who don’t want to have to defend their climate denial. Senate Republicans may not believe climate change is an existential threat to humankind, but they recognize that the goals of the Green New Deal are an existential threat to Big Oil, oil-industry magnates and major Republican donors the Koch brothers, and their corporate polluter allies. That’s because the Green New Deal has the power to reshape our energy system, our economy, and our democracy. At its heart is a massive investment in 100 percent clean, renewable, zero-carbon-emitting energy. It calls for building green transportation and climate-resilient infrastructure. It will supercharge investments in solar, wind, all-electric vehicles, and energy efficiency. It guarantees benefits to our workers and creates millions of good blue-collar jobs. It will protect the front-line and vulnerable communities who have been most affected by fossil fuel pollution. The Green New Deal is about jobs and justice. McConnell and Republicans think the Green New Deal is just a resolution, but it is a revolution. 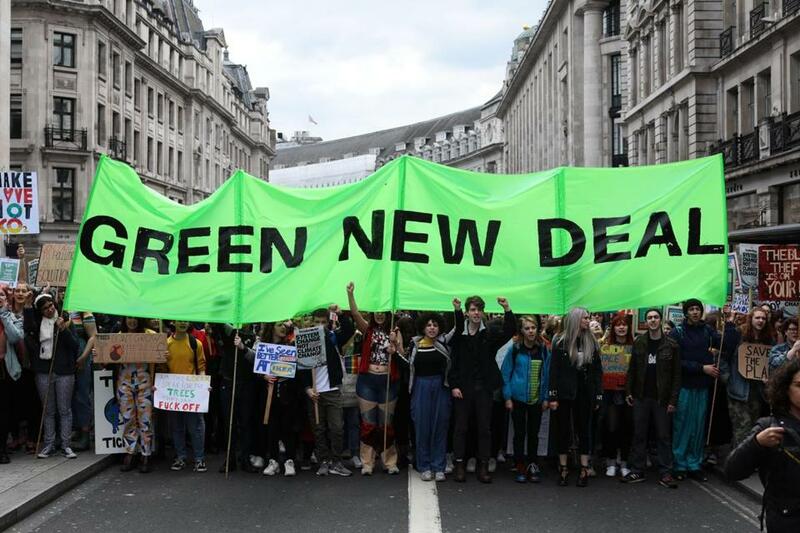 A revolution on our streets, where an army of millions of young people and students across the planet take to the streets and strike for climate action. A revolution in clean energy, where we are creating jobs and growing our economy. In 2018 there were 116,00 clean-energy workers in Massachusetts, accounting for more than 3 percent of our workforce. And a revolution at the ballot box. We could see 10 million more votes cast in 2020 than in 2016. And many of those voters care deeply about climate change. A recent poll showed 87 percent of likely voters in the first five primary/caucus states believe it essential or very important for candidates to have a clear plan forward on climate change and to move to 100 percent clean energy. And with 63 percent of voters in a recent NBC/Wall Street Journal poll believing Republicans are out of the mainstream on climate change — even more so than on issues like immigration, health care, or abortion — it’s clear that Americans see the GOP on the wrong side of this debate. This Green New Deal resolution vote in the Senate is not the end of the debate on climate action, it is only be the beginning. That’s because now is the era of the Green New Deal. This resolution was always designed to be the opening of a national discussion, and it has worked. There has been more debate about climate change in the few weeks since we introduced the Green New Deal than in the last decade. This resolution has struck a powerful chord with the American people, and the demand for immediate action will not stop. I hope that policy makers and elected officials at all levels of government put forward their proposals on how we can meet the bold goals outlined in the Green New Deal. I plan to do so in the coming weeks and months. We must have those debates in our homes, our businesses, and in Congress. But we cannot wait any longer to have them. Scot Lehigh | Green New Deal fears: Will AOC rustle our cows? US Senator Edward J. Markey of Massachusetts is former chair of the House Select Committee on Energy Independence and Global Warming and the author of the American Clean Energy and Security Act of 2009.